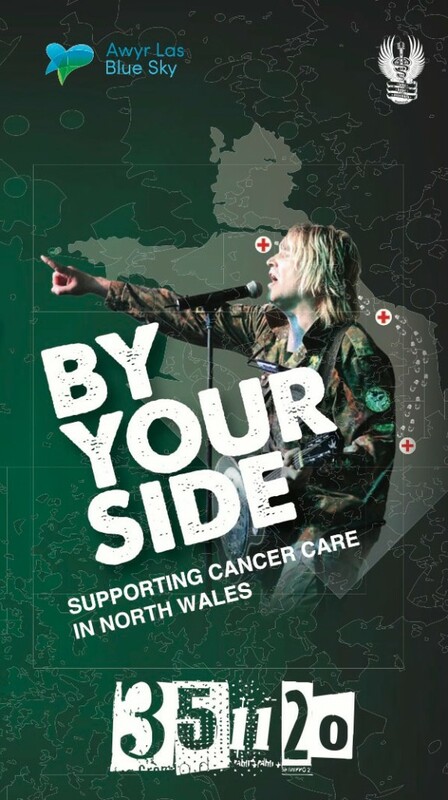 Love Hope Strength co-founder, Welsh rocker and cancer patient Mike Peters is launching a major ‘By Your Side’ fundraising drive to enhance cancer care across North Wales with a ‘Big Busk’ in each of North Wales’ 3 biggest hospitals. Peters, from Dyserth, Denbighshire, will be joined by local choirs and schoolchildren, as well as patients and healthcare staff for the launch of the ‘By Your Side’ (Wrth Dy Ochr) appeal. Peters was first diagnosed with lymph cancer in 1995, and after going into remission in 1996, he received the devastating news that his cancer had returned as Leukaemia in 2005. Since then, Peters has received regular treatment on the Alaw Unit in Ysbyty Gwynedd Hospital. Betsi Cadwaladr Health Board’s Head of Cancer Services Sharon Thomas said the ‘By Your Side’ appeal would play an important role in helping healthcare staff deliver excellent care for an ever increasing number of patients. Peters is planning to take part in a range of different fundraising activities over the next few years to raise money for the campaign, from growing a beard during the month of ‘JanuHairy’ to organising his annual ‘Snowdon Rocks’ event. He’s encouraging the general public in North Wales to get behind the campaign. To find out more about the appeal, please visit www.byyoursideappeal.org, www.wrthdyochr.org or www.facebook.com/awyrlascharity, or call the Awyr Las Fundraising Support Team on 01248 384395.